If it were not for a flash flood in Las Vegas, Patrick Hood might never have found himself on the other side of the country attending Vassar College in Poughkeepsie, New York. Hood was on his way back from class at the University of Nevada, Las Vegas (UNLV) when the fine weather abruptly deteriorated into a violent rainstorm. He was in a stairwell when the flood waters started cascading down and when the deluge subsided, he was left with a broken leg. While he was laid up from his injury, Hood saw a call to apply to Vassar College through the Posse Veterans Foundation on a website for veterans of the Iraq and Afghanistan wars. “I joked that there was no chance in hell I would ever be accepted,” he says. After going through the admissions process, he was admitted to the college, where he now majors in science, technology and society, with a minor in economics. Hood’s path to Vassar was also exceptional in that he was one of 10 students in Vassar’s first cohort of veterans brought to the college through the Posse Foundation. Veterans make up only a tiny fraction of the undergraduate student population at many of the nation’s well-resourced Ivies and other private elites. They have the option of attending private, nonprofit colleges using Post-9/11 GI Bill funds through the Yellow Ribbon Program, which pays for all resident tuition and fees for public schools and a certain amount in tuition and fees at private schools. Despite the incentives to do so, they are simply not applying in large numbers, officials at elite colleges say. More than 2.1 million students have made use of Post-9/11 GI Bill funding since its inception in 2009, according to the Department of Veterans Affairs (VA). Of those students, more than 1.1 million used the money to pay for public school; more than 661,000 used the funds to pay for private for-profit schools; and 363,039 students used the funds for private nonprofit schools. The VA could not confirm the number of veterans who attend four-year, private nonprofit schools. Brown University currently has 12 veterans enrolled as undergrads, and Yale University has 11, up from six last year. Williams has three veterans enrolled; one sophomore and two freshmen. 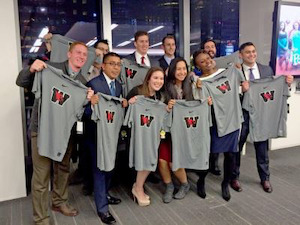 The Posse Veterans Program, through which Hood attends at Vassar, is one of a few programs that offer structured pathways to a select group of elite colleges for veterans. The Posse Foundation is known nationally for its work in identifying talented high school students who might be overlooked in the college admissions process and matching them with elite schools across the country. It works in a similar way for veterans. Veterans participating in the program are placed in three Posse partner schools: Vassar, Wesleyan University and Dartmouth College. The program is now in its fourth academic year, but there is room to expand, says Deborah Bial, founder and president of the Posse Foundation. She says that the goal is to bring the number of institutions partnering with the veterans program up to 10 or 12 over the next few years. “We have such amazing men and women that we’re interviewing for the program, and we could easily expand,” Bial tells Diverse. Vassar, the first to initiate the program, in the 2013-14 school year, now has 43 veterans and dependents of veterans enrolled. The college started talking about bringing more veterans to campus with the rollout of the Yellow Ribbon component of the Post-9/11 GI Bill, Dr. Catherine Bond Hill tells Diverse. Hill served as president of Vassar from 2006 to 2016, stepping down from the position in August. Veterans are older than the average Vassar student, who typically arrives on campus fresh out of high school. They also have a great deal more life experience under their belt, having served across the world and sometimes in combat zones. Yet the argument for bringing veterans to campus was a compelling one. “It was consistent with our institution’s mission of creating a very diverse student body, broadly defined, including different socioeconomic groups and different life experiences,” Hill says. Even after Vassar joined the Yellow Ribbon program, few veterans appeared in the applicant pool. It became evident that the school would need to do something different if it wanted to attract a larger population. During a phone call with the Posse Foundation about a separate program, Hill came to a realization. “It occurred to me that, rather than having each of our separate institutions go out and find veterans, this would be a perfect thing for Posse to do,” she says. Elite colleges have some disadvantages when it comes to competing with large, public institutions, says Antonio Farias, vice president for equity and inclusion and Title IX officer at Wesleyan University. Farias is the institutional liaison with the Posse Foundation and an Army veteran. The University of Connecticut waives tuition for admitted veterans altogether, for instance, giving it a bit of a competitive advantage over a school like Wesleyan, with its $50,000 price tag. In addition, some of the intangible benefits of a liberal arts education might not be immediately obvious to veterans, many of whom have already acquired technical or vocational skills after years of service. “They assume that, with liberal arts colleges, ‘liberal’ means liberal in the political sense — that this is not a place for people in the military. They also might do a passive scan of our website and not see any vet presence there, nothing highlighted to make it clear that veterans are welcome. And, finally, there’s the sticker price,” he says. This is not to say that all veterans are averse to the concept of a liberal arts education. When Eduardo de la Torre first heard about the Posse program through a friend of his then-fiancée, now wife, he was skeptical. He had dropped out of Texas A&M after 9/11 to enlist, and although he planned to complete his degree one day, liberal arts colleges were not high on his radar. Since arriving at Vassar, de la Torre has embraced the liberal arts model. In the two or three years prior to partnering with Posse, Farias says, Wesleyan had an average of two veterans total enrolled on an annual basis. With Posse helping to spread the word, that number has bumped up to 32. College officials say that admitting veterans is only one part of the equation. Once they started arriving on campus in larger numbers, their particular needs became more apparent. For instance, some are married and have families. Others are disabled and must coordinate medical benefits through the VA.